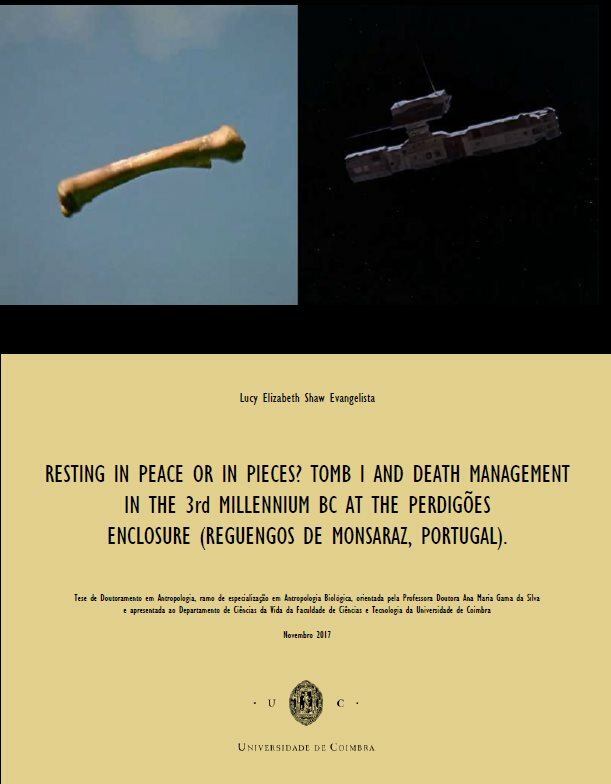 Lucy Evangelista presented her PhD thesis to the University of Coimbra. 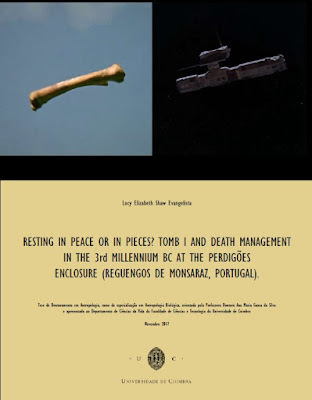 For this study, the human bone sample recovered from Tomb I was analysed from a bioarchaeological perspective with the aim of contributing towards a better understanding of the Late Neolithic/Chalcolithic individuals that used the Perdigões prehistoric enclosures (Reguengos de Monsaraz, Portugal) as a burial site, and their attitudes towards death. (I) the analysis of the human remains exhumed from Tomb I, in order to characterize demographic, morphologic and pathological aspects of the population(II) based on physical anthropological analysis and the archaeological register, identification of funerary rules and attitudes, relating them to mental constructions towards death through a study of: the conception and form of deposition of human remains; the organization of the internal space of the tomb; evidence of ritualization; signs of management of the funerary space (III) to understand how the specific mortuary practices identified in Tomb I fit into the global funerary practices already known for the rest of the important archaeological site of Perdigões (IV) Tomb I was also understood within the context the history of the use of other tholoi type structures in the territory that is now referred to as South Portugal. Tomb I is a tholos type structure from Perdigões Archaeological Complex, dated from the first half of the 3rd millennium BC and excavated between 1997 and 2001.The sample was in poor state of conservation and highly fragmented, and skeletonized elements were found completely disarticulated. Anthropic and natural taphonomic alterations were limiting factors of the study. A two-fold approach was applied to the study of the skeletal sample from this funerary structure. First, it was studied according to the archaeological phases defined after field work, which sought to understand possible differentiated uses of the tomb through time. The skeletal sample was then studied as a whole, regardless of phases of use. 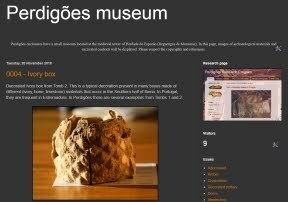 The data obtained through this latter anthropological study were utilized for the paleodemographic reconstruction and for the identification of potential patterns in mortuary practices and for further comparison of this monument with other funerary structures inside and outside Perdigões Archaeological Complex. Both approaches mirror the same reality: the collective, commingled use of this tomb for deposition of human remains from both sexes and individuals of all ages. A total of 61926 bone fragments and 1579 teeth were studied. The paleodemographic approach estimated an MNI of 103 individuals for this structure: 55 adults and 48 non-adults (below 15 years of age at death). Results showed both sexes were represented, while non-metric trait data, highly limited by the conditions of the sample, delivered few results. Calculus was identified on 20,6% of the analysed teeth (289/1399) and linear enamel hypoplasia on 10,4% (143/1369) of the tooth sample, making them the most frequently represented dental pathologies for permanent teeth. Average tooth wear in this sample was low: 1,9 (n=1428) very close to the level of wear obtained for deciduous dentition: 1,8 (n=84). Cariogenic lesions were found on only 0,5% of the 1406 permanent teeth analysed and antemortem tooth loss was identified in 5,3% (n=29/539) of the observable alveoli. Skeletal pathological changes related mostly to joint disease, found mainly on upper and lower limb bones and the spine. The presence of enthesopathies were most commonly found on the lower limb and foot bones. Some evidence other diseases, such as infectious, congenital, metabolic and traumatic conditions, was found, but in low frequencies. However, the rarity of some of these pathologies for prehistoric contexts must be highlighted, as the probable case of Hyperostosis Frontalis Interna identified on an individual from Phase 2C. The analysis of the use of the chamber for funerary depositions throughout the different phases revealed that different physical areas were used for the depositions of human remains and artefacts. In terms of Funerary Anthropology, Tomb I constitutes a burial site where an obvious and intense manipulation of the skeletal remains took place. No anatomical connections were identified and evidence suggests the secondary use of this funerary structure, although the possible presence of primary depositions at some point of its life cannot be overruled. Comparison with other tholos/tholoi type structures made it possible to record differences in demographic, morphological and pathological features between coeval populations.